Is there a hospital on Phi Phi Island ? Where is the police station ? And the post office ? What newspapers are available on the island ? How to connect to Internet ? Are there any laundries on Phi Phi ? All the answers to these very specific questions - and others - are there: "Phi Phi Practical Information". A great challenge for big appetites and broke backpackers : At "The Hungry Buffalo", eat a giant hamburger of 800 grams (1.76 pounds) in less than 30 minutes and you will not be charged. (Cash bonus if you beat the record). 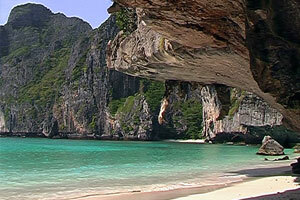 Many day trips are organized to Phi Phi from Phuket in particular. Thus, between 9am and 3pm, hundreds of tourists arrive for the day. 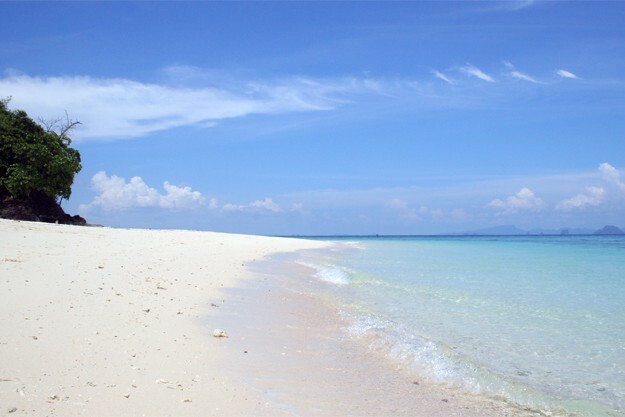 This is the perfect time to escape on the other inhabited islands of the archipelago (Phi Phi Leh, Mosquito Island and Bamboo Island for example). But be careful, daily organized tours also go to these spots, especially Maya Bay, literally saturated with tourists during the day. Photo: Bamboo Island, north of Koh Phi Phi Don. You'll quickly realize that everything is cheaper when you move away from the center. To save money, go to Phi Phi market. 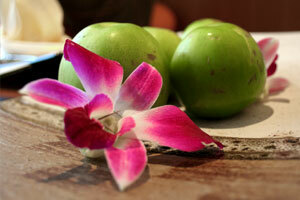 Fresh fruit trays, skewers and fried fish or chicken, cost between 15 and 30 Baht. By early evening, each bar has a promotion that usually changes every day, cocktails, beer at reduced prices, etc. In some bars, women are being offered their first drink or pay for their drinks half price. 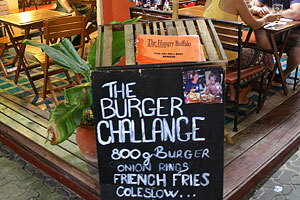 More information about Bars and Restaurants in Phi Phi. On the way to Phi Phi Viewpoint, do not touch the big worms that look like brown millipede. They are dangerous! Traffic is prohibited on Phi Phi. Residents and tourists travelling by bike... sometimes at dizzying speeds. To signal their presence, cyclists operate their bell, be careful. In case of injury, the small hospital is located 5 minutes walk to the west of the pier (opposite direction of the village). In case of more serious injury, you must go to Phuket hospital. The police station is located east of Tonsai village towards Long Beach. On every Phi Phi beaches, the speakers are ready to disseminate tsunami warning. In this case, follow the signs "Tsunami Evacuation Route" leading to Viewpoint, the highest point of the island, east of Ton Sai village. A 20 minutes walk is needed to get there. 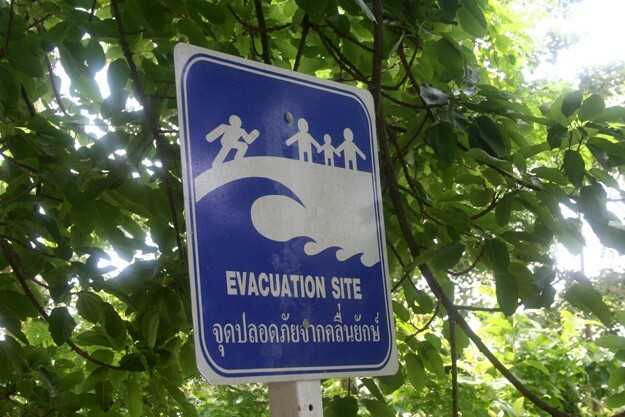 Photo: "Tsunami Evacuation Route" sign in Koh Phi Phi. The 2004 tsunami destroyed nearly all the island's infrastructure (70%), except some large concrete buildings. The new facilities are now more solid and - usually - designed to withstand a tsunami. 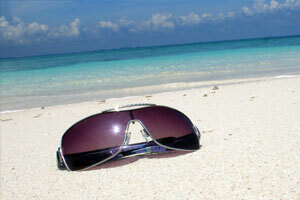 When in doubt, opt for the rather high bungalows (Ao Lo Dalam area) and beware of small structures on the beach. Phi Phi Cabana and Phi Phi Hotel on Ton Sai Bay, are the most massive buildings of the island. At off-peak hours, usually in the morning or evening, some Internet cafes discount prices. One can easily find free Wi-Fi in some restaurants / guesthouses. If you have any travel guides or books that you no longer use, DS Books buys and sells used books.